Competition in the global automotive electronics market is likely to increase, as the leading players are using different strategies to strengthen their position in the market. Growing entry of new players in this market is also expected to further increase competition in this market. The report published by Transparency Market Research elucidated about these strategies used by key players. Companies are focusing on research and development activities to develop new products to provide advanced services to their customers. Mergers and acquisitions and expansion are other strategies widely adopted by the players operating in the global automotive electronics market. Some of the prominent players analyzed in the report are Maxim Integrated Products Inc., ST Microelectronics N.V., ON Semiconductor Corp., and Robert Bosch GmbH, Infineon Technologies AG. 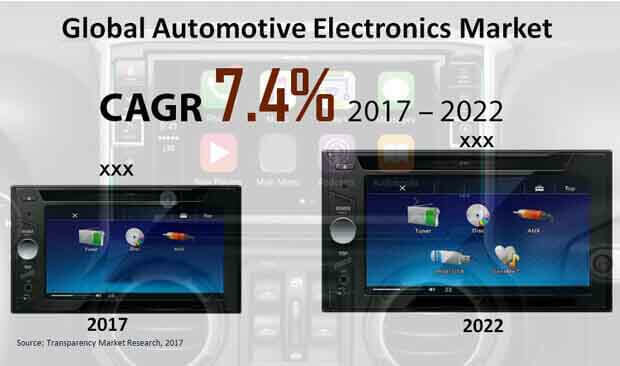 According to the TMR’s report, the global automotive electronics market is expected to rise at a steady CAGR of 7.40% over the projected period between 2017 and 2022. In terms of revenue, the market valuation is estimated to reach US$5.04 bn by the end of forecast period. In 2017, the global automotive electronics market earned US$3.53 bn. In terms of sales channel, the OEM (original equipment manufacturer) segment is likely to hold maximum share in the coming years as compared to its counterpart i.e. aftermarket segment. The OEM segment is rising due to increasing consumer preference to buy electronic components directly from manufacturers, as these components play a vital role in vehicle performance. On the regional front, Europe is estimated to dominate the global automotive electronics market during the forecast period. The automotive electronics market in Europe could rise at 6.5% CAGR due to increasing demand for advanced automotive vehicles. Whereas, developed regions in Asia Pacific are expected to hold substantial share in this market in the near future. Demand for advanced automotive vehicles has increased in both developed and developing economies. This growth has further augmented demand for advanced safety-systems such as lane departure warning (LDW), airbags, and automatic emergency braking (AEB). Moreover, the demand for advanced features likes alcohol ignition interlocks, accident data recorder systems, and emergency call systems have grown rapidly. Adding further to the growth drivers, growing application of automotive electronics in safety systems, body electronics, powertrain, and advanced driver assistance are further fueling growth in this market. Furthermore, manufacturers working on the global automotive electronics market focusing on advanced technologies and innovation, which is projected to diversify the global automotive electronics market in the coming years. On the contrary, protection of complex electronic systems and reducing damage caused by electrical hazards is the key challenges faced in the global automotive electronics market. Additionally, strong government regulations related to vehicle safety might also hinder growth in this market. However, growing environmental sustainability with high demand for innovative infotainment systems are likely to fuel demand for complex electronics systems thus, expanding the global automotive electronics market. Introduction of advanced technology in-vehicle safety could help in overcoming these challenges. The study presented here is based on a report by Transparency Market Research (TMR) titled “Automotive Electronics Market (Vehicle Type - Compact Passenger Cars, Mid-sized Passenger Cars, Premium Passenger Cars, Luxury Passenger Cars, Light Commercial Vehicles, and Heavy Commercial Vehicles; Sales Channel - OEM and Aftermarket; Application - Advanced Driver Assistance Systems, Body Electronics, Entertainment, Powertrain, and Safety Systems ) - Global Industry Analysis, Size, Share, Growth, Trends and Forecast 2017 - 2022”.